This celestial globe is one of the rare surviving examples of a printed globe made in the 16th century. Manuscript globes were more common, and could be made in different sizes. Larger manuscript globes allowed the information given on the instrument to be read more easily. The very small dimensions of this globe make it rather difficult to read. The wooden sphere is solid. The constellations and signs of the zodiac are coloured and the inscriptions are in Latin. 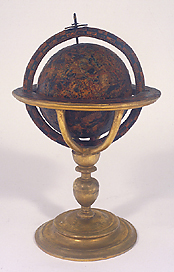 The author of this celestial globe, Mario Cartaro, from Viterbo, also made the corresponding terrestrial globe, now conserved at the Observatory of Monte Mario in Rome.